The BSFA’s Vector Review of 2017 was delivered today, which includes a piece I wrote on the bit of genre reading that stuck in my mind most clearly in the past year. I chose a few panels from a crossover comic book. The piece got a bit mangled in the production process (some repeated text and confusion) so this is the definitive version. My genre highlight of 2017 is really just a handful panels from a comic book. 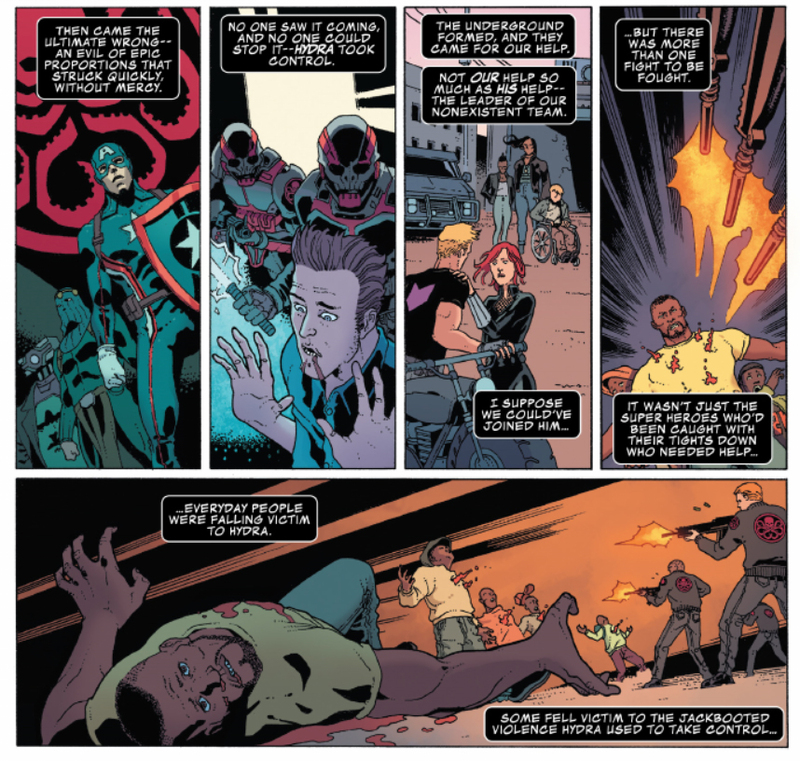 It’s from Occupy Avengers #8 (June 2017), written by David F. Walker and drawn by Martin Morazzo and Jorge Coelho. The story is a tie-in to the Secret Empire crossover that dominated Marvel’s line of books in the middle of 2017 and, at a casual reading, the panels are easy to overlook. The story features those resisting the authoritarian rule of Hydra (led by the briefly evil Captain America) which has taken control of the American government. In one panel a black man is being shot. He seems to be standing in front of a group of black men, trying to protect them. 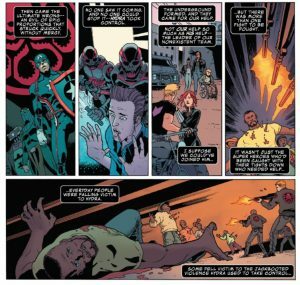 In the second panel the unidentified man lies dying on the ground and the people he was trying to protect are being gunned down by white men in Hydra uniforms. Seven pages later, briefly and a bit obliquely, we learn that the man we saw being shot was an out-of-costume superhero, Nighthawk. There have been about half-a-dozen different “Nighthawks” – a C-list character with a mixed-up history. He is usually the alter-ego of white millionaire Kyle Richmond, created by Roy Thomas and Sal Buscema as part of the Squadron Sinister so that Marvel’s Avengers could face-off against an ersatz version of DC’s Justice League from an alternate reality. That Nighthawk, a Batman surrogate, has generally been a bit of an arse – one version of his origin has him getting powers after killing his girlfriend while drunk driving, another early appearance has him pretending to be a hero fighting Daredevil just so he could be famous, and a later take, in The Defenders, sees Richmond narrowly avoid jail for tax avoidance and corporate fraud (a story that surely deserves revisiting in this new gilded age). That Nighthawk, however, is not this Nighthawk. This Nighthawk is an African-American – also from another reality – who emerged from Marvel’s 2015 Secret Wars crossover to take Kyle Richmond’s place (accidentally killing him in a fight) and then adopted the name Raymond Kane. In 2016 David F. Walker wrote a series featuring this Nighthawk that was both brutal and a clever inversion of the Batman mythos. This Nighthawk hunts a vicious, Jokerish, psychopath in Chicago but the story’s real villains are corrupt police, gentrifying property developers, racism, inequality and America’s gun culture. 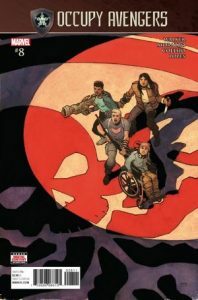 Walker’s books for Marvel (as well as Nighthawk and Occupy Avengers, he’s had recent runs on Power Man and Iron Fist and Luke Cage) have been interesting, sometimes challenging and intelligent, but not commercial hits. Nighthawk’s solo adventures only lasted six issues, but it was one of my favourites of 2016. Unlike all previous incarnations it seemed possible that this Nighthawk could have developed into something genuinely interesting. Then Raymond Kane is killed. Worse, he is thrown away in a barely noticeable flashback in someone else’s comic. It seemed pointless, infuriating, stupid … and yet, as time has passed, I have thought more about these few panels than anything else I’ve read this year. Walker knows, of course, that in America today the gunning down of a black man – whether it’s by the police or by someone else – is an event that is all too frequently passed over. It is something often witnessed but regularly ignored by the media and swept, with practiced swiftness, out of sight by police and courts. It is 62 years since the murder of Emmett Till energised what would become America’s Civil Rights Movement and four years since the acquittal of Trayvon Martin’s killer sparked the birth of Black Lives Matter movement, but the outrage and attention won by these high-profile cases remain exceptions, despite the best efforts of generations of protesters. Injustice and death remain everyday realities and, in most cases, the profound silence persists. Young black men are five times more likely to be killed by a gun in America than white men and while white gun deaths are overwhelmingly suicides (77%), black deaths are overwhelmingly homicide (82%), according to America’s Centre for Disease Control and Prevention. As I write this (almost at the end of December) The Washington Post has recorded 971 police killings in America in 2017 – over 40% of these incidents have seen black or Hispanic men killed, despite this group making up only around one in ten of the American population. The casual disposal of Raymond Kane is art reflecting reality in an era when a statement like “black lives matter” can somehow become controversial and divisive. 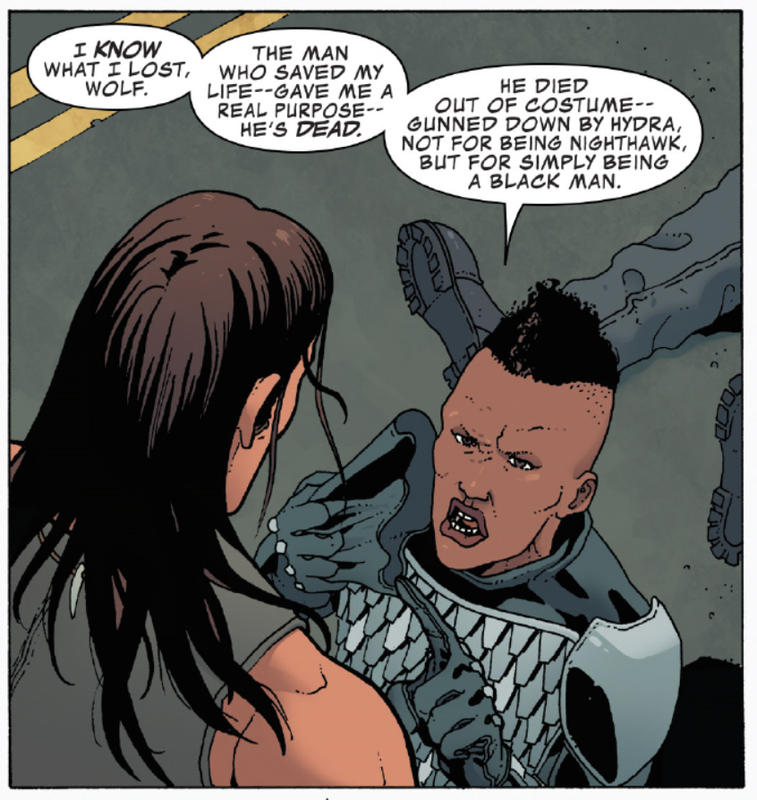 Given the themes Walker has explored with this Nighthawk there could, in retrospect, hardly have been a more truthful or more timely statement for an African-American comic book writer to make than to gun down a contemporary black superhero without fuss or hype. There is no magical resurrection, no investigation, no consequences and no sombre funeral oration from Captain America or Tony Stark. Raymond Kane’s murder goes almost unnoticed, unmentioned by all but his closest friend. It hardly mattered to Raymond Kane that Hydra happened to control America’s government at the moment he was shot, as Tilda points out: “simply being a black man” was enough to seal his fate. The more I think about it the braver and more essential a piece of writing these seemingly throwaway panels become. So, farewell Raymond Kane. In dying, almost unnoticed, you became something no one else in a Nighthawk costume has ever been: you were important. This entry was posted in Uncategorized and tagged 2017, bsfa, comics, Marvel, review, reviews, sf, Vector. Bookmark the permalink.